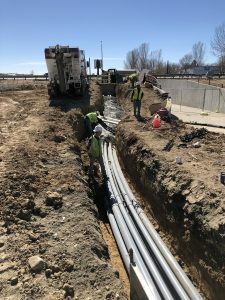 On-Demand Concrete has started a project with the City of Loveland and GE Construction for 1600 CY of concrete for thermal duct encasement. This pea gravel mix is a lower psi concrete and is poured over electrical conduit or duct banks. This is done for 2 reasons. First it is poured onto the ducting so that it can’t be accidentally dug up and damaged, secondly it is for heat mitigation for the high voltage lines. It allows heat to escape so the wires don’t overheat. With our ability to bring more than what is ordered, the contractor doesn’t need to be worried about his exact yardage. We pour what is needed and save the contractors cost and eliminates the worry of over-ordering.